There’s a common school of thought relating to getting yourself in front of those things you really loved as a kid, and being bitterly disappointed when you realise that as a ‘grown up’, childhood memories should perhaps be best left as such. 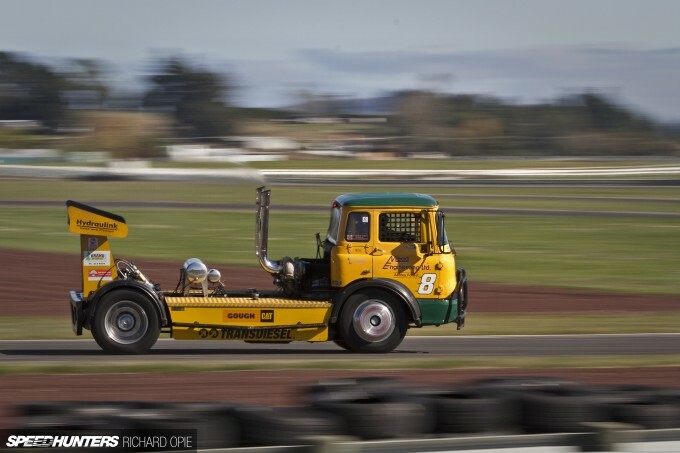 With the proverbial ‘never meet your heroes’ proverb jangling about in mind, I recently attended an event billed as the New Zealand Truck Racing Festival – a tail-end-of-the-season, club-level shindig featuring 5-ton behemoths lumbering around the track. 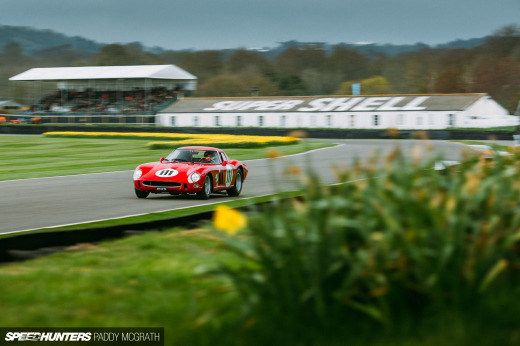 That intro might appear somewhat long-winded and irrelevant, but to give it some context, the last time I was sat trackside watching these exhibitions of excess circulating a close section of tarmac would have been as a fresh face 10-year-old sometime around 1992. I can vividly remember feeling beyond excited at the guttural thud of the large capacity diesels and the sights of colossal chromed snouts peeking through clouds of filthy murk. For a formative motorsport fan, this was the very definition of sensory overload. Nevertheless, I trudged down-country to have a nosy. For the first time in over two decades I was going to meet those childhood heroes. Braced for disappointment as I drove through the gates, the sentiment soon dissolved the second the spool of a hefty turbo and the baritone thrum of giant pistons breathing through drainpipe dimensioned exhausts met my eardrums. A wry smile rapidly gave way to a light bulb moment – ‘I need to shoot a race truck, and it must be wild’. So, meet this 1975 Bedford KM, proudly campaigned by its modest yet quietly crazy pilot Tony Brand – a man who knows a thing or two about heavy transport due to conducting his day-to-day business in the logging industry. Back in 1973, this model was marketed by Bedford as their heavier duty option and featured a 7.6-litre in-house-developed diesel. Sitting slightly aft of the front axle, Tony’s truck finds itself motivated by a somewhat less modest Detroit 6V92T 2-stroke diesel V6, displacing 9.0 litres. While on the smaller end of the truck racing scale, the Detroit makes itself audibly known on track, paying clear homage to the ‘Screaming Jimmy’ nickname these hardworking engines earned in period. 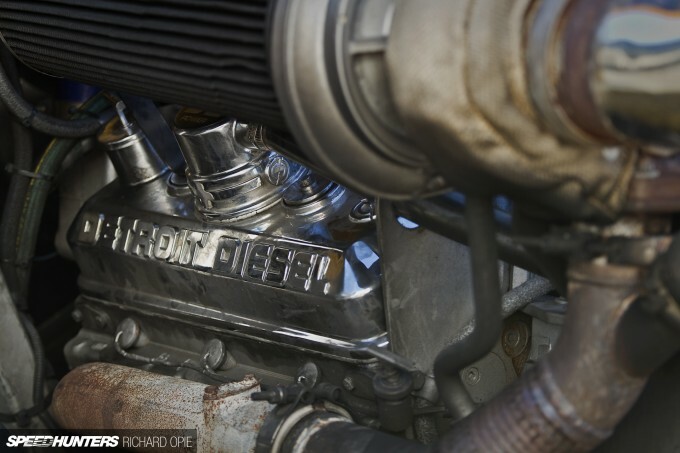 Like any race engine, the Detroit is built to spec – in this instance by a specialist diesel workshop. Internally, the 6V92 sees a set of shot-peened rods and a shot-peened crank, while in the name of keeping combustion temperatures down the chambers in the head and the tops of the pistons have been ceramic coated. Valves obey the commands of a custom cam grind designed to maximise torque a little higher in the rev range than normal. The visibly impressive intake side is where things get interesting however. 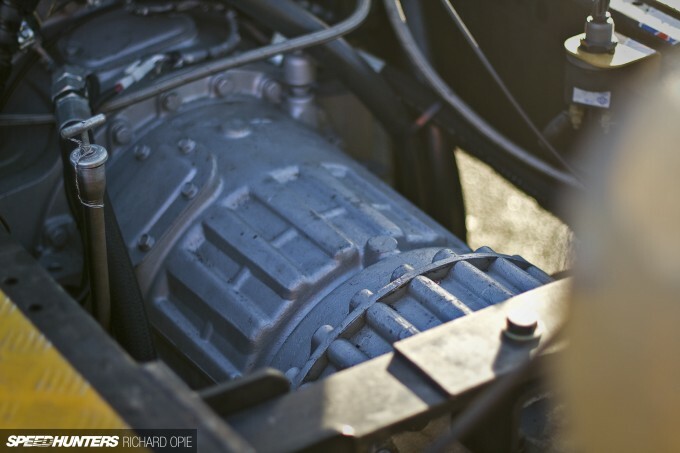 Not only is the Bedford fed compressed air by a pair of whopping great 80mm BorgWarner S400 turbochargers standing proud behind the cab, but between the cylinder banks sits a supercharger. 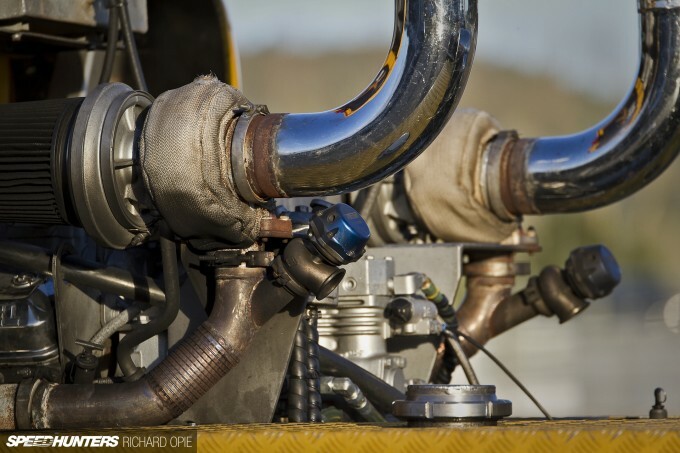 The blower acts until 2.000rpm when a pair of chokes open, bypassing the unit and letting the turbos do their thing supplying 38psi of boost right up to the 3,040rpm maximum – controlled solely by twin 50mm Turbosmart ProGate wastegates. To date, the motor’s pumped out an unstressed 800hp at the crank on an engine dyno. Twin 5-inch stacks expel clouds of black smoke, which Tony openly admits “are just for a bit of a show,” rather than any particular performance application. Drive is provided by a 5-speed automatic Allison transmission, shifted manually, while a supersized Detroit locker ensures all four rear truck racing specific semi slick tyres hook up. Casting an eye over the chassis, it appears that on the face of it the same principles apply as they do to race cars. Out the back, a set of adjustable platforms capture the locomotive-spec rear springs, with damping controlled by custom-brewed Öhlins remote reservoir shocks attached to an axle located by a jumbo 3-link and Watts linkage arrangement. A somewhat crude arrangement of leaf springs controlled by similar shocks keeps the front end pointed in the correct direction. Four wheel discs atop 10-bolt trailer hubs haul all 5 tons up. Like any race vehicle, the Bedford is strictly business inside with a mandatory rollcage and a myriad of gauges to monitor everything from boost to air pressure and everything in between. Finishing my short time with the truck, I took a moment to sit back and take it in… Was this really as good as it was all those years ago? I think I can answer a vehement ‘yes’ – especially given the technical understanding and appreciation of what it takes to manhandle a machine of this ilk around a circuit. The best thing? This has, so far, been Tony’s first and only foray into circuit racing! SpeedHunters never cease to amaze me! I didn't expected to see here one of my favorite trucks! I really appreciate the technical details and photos on features like this. This one is especially unique. Thanks! One thing id be interested to know is how the tires are made. Normally the tires for rigs are multiple plies of reinforcement for hauling heavier loads. So I wonder if they actually do the same for the race tires? To me that would be interesting to know. 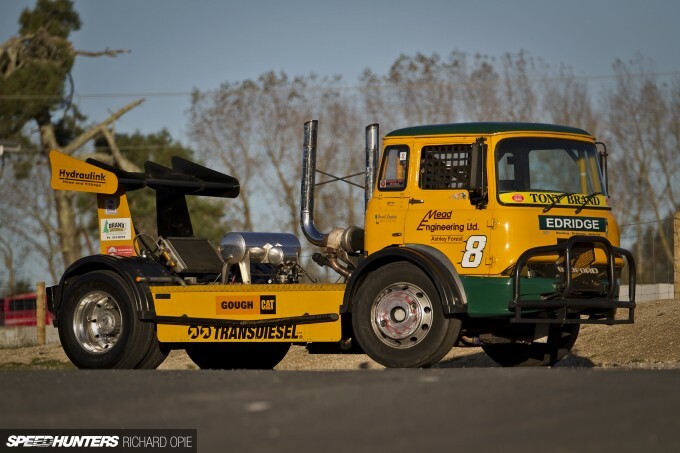 Big, cabover rigs racing. Oh yes. Yes, a real truck! Reminds of the truck racing that was on Wide World of Sports TV when I was a kid. Can't mistaken a two-stroke for anything else either. 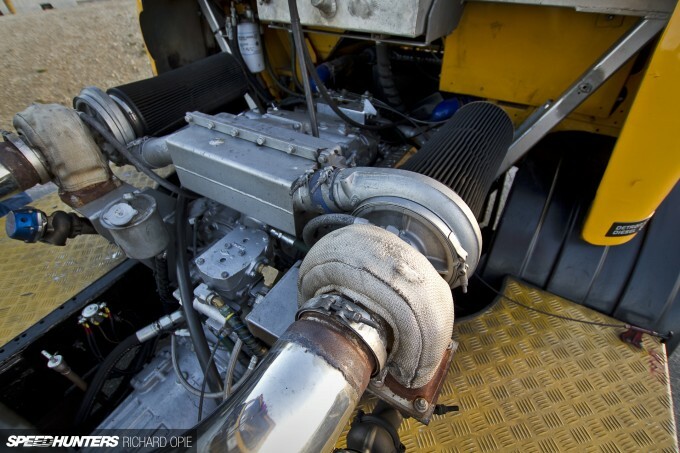 Small correction Richard Opie, the blower on a two-stroke diesel isn't a supercharger. The blower functions as a scavenge pump so the motor can breath and expel the exhaust gases. 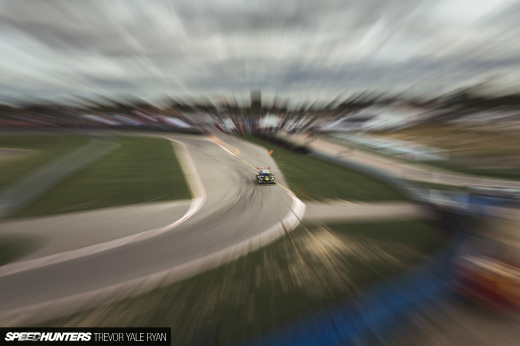 This would be fun to watch at COTA. Maaad! Simply no other way to put it. This is insane! FAYoshida Formula Truck é show demais! Awesome article! I noticed a mistake though you mention valves and a cam in the engine build but I do believe two stroke engines have neither. Hydrolastic duurrrrhhh I should have known that, but yes you are totally correct! ACSmith6589 I thought the same so did a bit of Google research on the Goodyear "Truck Racing" tyre these trucks use.... it appears they do have similar reinforcement, being based on a standard Goodyear heavy vehicle tyre, but with the substitution of a more race-friendly tread compound and pattern. If anyone knows more in depth detail I'm keen to know too! therealnecroscope Cheers, I thought it might be something a bit different - definitely not the fastest of the trucks out there competing but undoubtedly one of the most unique and spectacular looking packages. Johnny_Bravo Thanks bud, appreciate the sentiment! The Detroit diesels do have a cam and valves however, as Hydrolastic mentioned before instead of using the piston to scavenge as in a piston ported engine, the blower on the top acts as a scavenge pump to enable the engine to do it's thing. Another moderately interesting fact is, when you're at the track shooting these things ALL marshalls and media must be clear of the circuit. Apparently they don't really stop too well when things go awry and end up forging their own path... at the Taupo circuit the options become very limited for shooting when you can't access 90% of the track! gun stealing and in addition gun firing accidents. the good old bedford sadly a name gone like most british made things.its little brother the tk Loved by coal men a common sight in the uk till the late 80"s.
Love the sound of a 2 stroke detroit as rode mamy many k"s in my dads detroit powered tm. 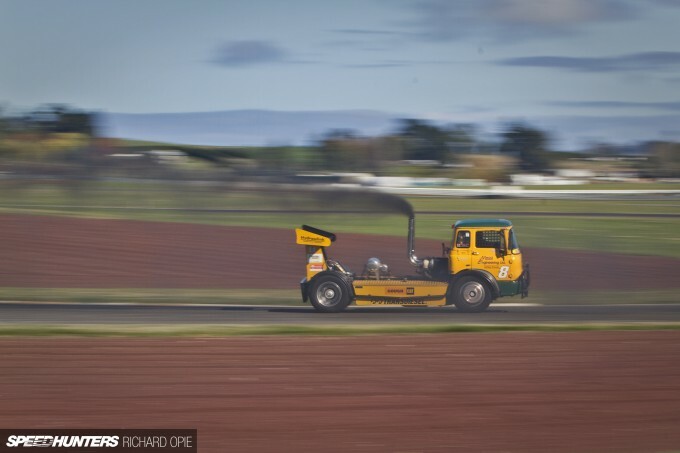 Back in the early days of truck racing they use to shave tread off the tyres and they were just road tyres.Use to love watching the road legal trucks racing in 85 at donnington. Now you need to do a shoot on the Bandag Bullet! @mike 800hp at 3040rpm means 1382ft•lbs at 3040RPM. The torque peak would likely be lower than that, but that's the only reference I'm given. Awesome feature and awesome machine.This leads me to a question: there is a British TV show simply named Crash that is broadcasted in the states on Velocity network. It features film clips of huge, spectacular wrecks with these types of racing rigs. I cannot find information/websites for this series at all. I doesn't have any credits when it is shown either and has a very general name. Does anybody have any info? I love watching the footage and the show also has Euro rally, WRC, Rallycross and BTCC wrecks. KrisMoffatt I only ever got to see that in Aussie magazines that made it over here, that's an iconic machine! Very rad article! Very good work Richard! Loving the speed shots. I remember watching these in 1996 race at Pukekohe. 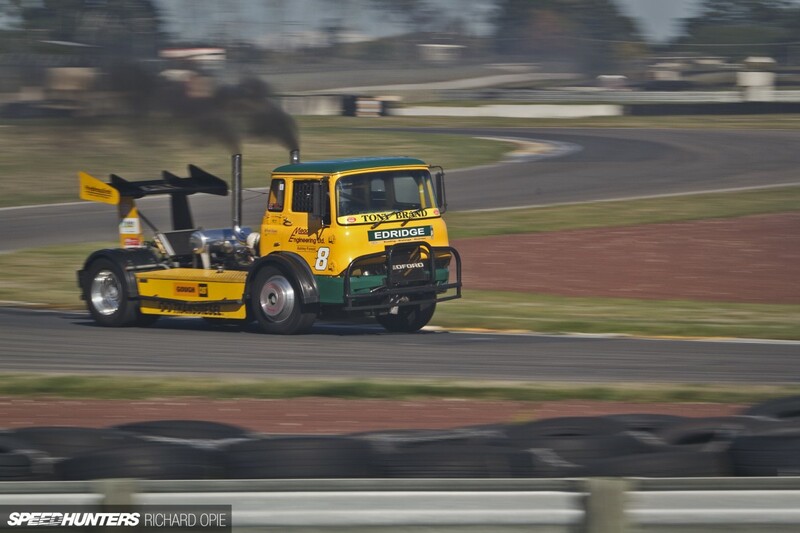 jbfromsiliconvalley In the UK the main series is the British Truck Racing Association (BTRA). Sky TV might still broadcast some if the races; been a while since I lived over there. 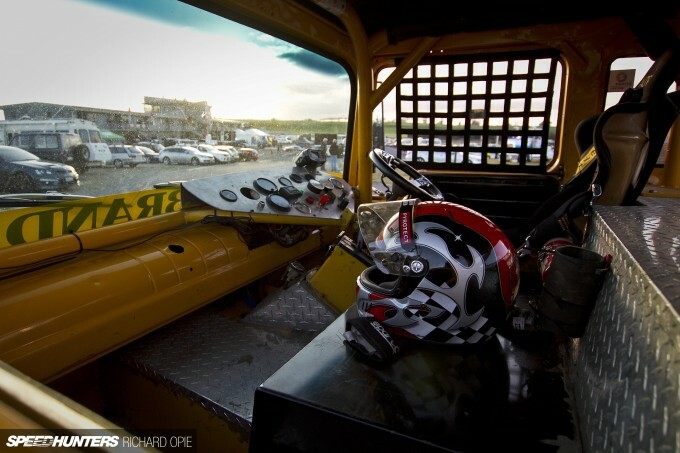 In the USofA, ChampTruck World Series has started its first year. Hopefully, I can make the Portland round in October. Diesel Mechanic here. The two-stroke Detroit diesels utilize a piston port flow. There is a cam and exhaust valves, but there are no intake valves. The blower provides the necessary positive airflow. pushrod-operated http://en.wikipedia.org/wiki/Poppet_valve in the cylinder head(s), with either two or four valves per cylinder. 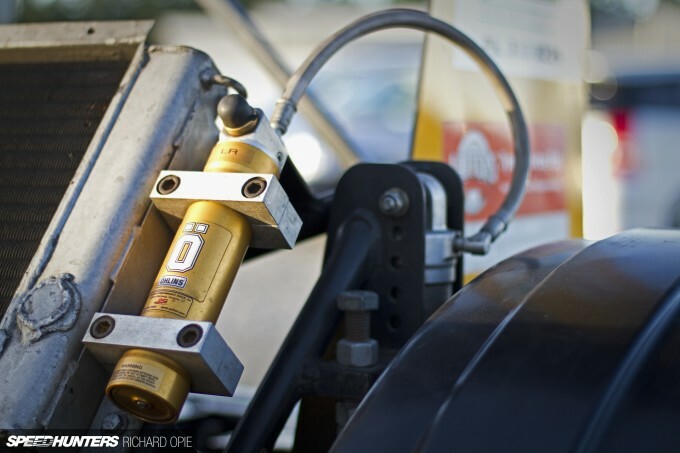 http://en.wikipedia.org/wiki/Unit_Injector is employed, one http://en.wikipedia.org/wiki/Fuel_injection per cylinder, with no high fuel pressure outside of the injector body. The injectors are cycled from the same http://en.wikipedia.org/wiki/Camshaft responsible for opening the exhaust valves."